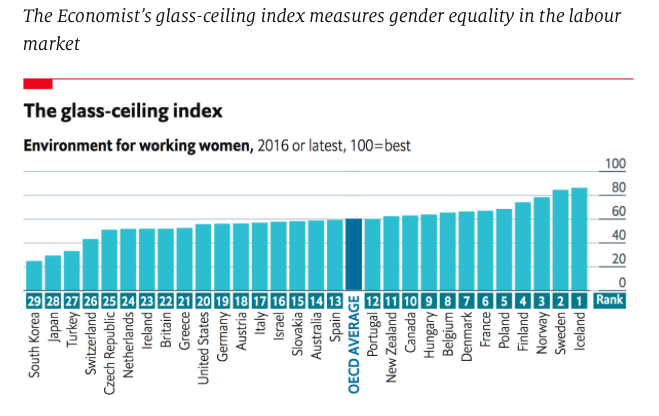 The Economist has published its fifth annual “glass-ceiling index”. It combines data on higher education, workforce participation, pay, child-care costs, maternity and paternity rights, business-school applications and representation in senior jobs into a single measure of where women have the best—and worst—chances of equal treatment in the workplace. Each country’s score is a weighted average of its performance on ten indicators. The overall picture painted by the data is that the long trend of improving conditions for working women has flatlined within the OECD, a club of mostly rich countries. In 2005, 60% of women were in the labour force; ten years later, this ratio had edged up only slightly to 63% (it was 80% for men in both years). With relatively few women climbing the ranks, and strong old-boys’ networks helping men reach the top, female representation in well-paid and high-status jobs is closer to a third than half. And the gender wage gap—male minus female wages, divided by male wages—is still around 15%, meaning women as a group earn 85% of what men do. These broad averages conceal wide variation between countries. 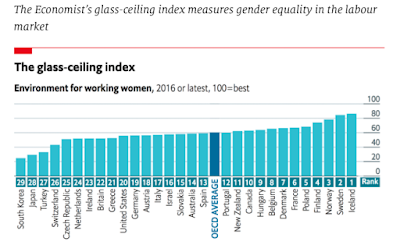 The Nordic countries clearly lead the world on gender equality at work. The top four positions this year belong to Iceland, Sweden, Norway and Finland, just as they did in 2016 (though Sweden and Norway did switch places). Women in these countries are more likely than men to have a university degree and be in the labour force. They make up 30-44% of company boards, compared with an average of 20% across the OECD. And voluntary political-party gender quotas mean that women are well-represented in parliaments. In October, women won a record 48% of the seats in Iceland’s lower house. At around two-fifths, Scandinavian women’s share of parliamentary seats ranks in the top 10% globally. Should America break up Washington? At the other end of the index are Japan, Turkey and South Korea. Women make up only around 15% of parliaments in these countries, and are underrepresented in management positions and on company boards. In South Korea, just 2% of corporate directors are female. Similarly, fewer women than men have completed tertiary education and are part of the labour force. Only 35% of Turkish women are working or looking for work, and a mere 16% have graduated from university. Progress in gender equality has a tendency to build upon itself. In Iceland, which currently provides the most equal working environment for women according to our index, female workers staged a protest last October in which they marched out of their offices early to call attention to the country′s 14% gender pay gap. If Japanese women were to do likewise, they would be leaving much earlier.